This song was originally published as "O! 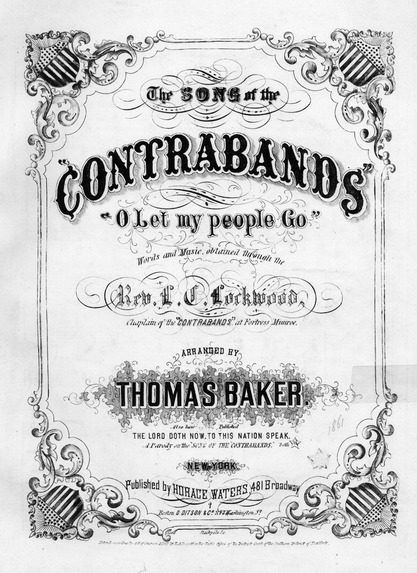 Let My People Go: The Song of the Contrabands." Though it is generally thought of as a spiritual, it was first recorded as sheet music after having been heard as a rallying cry for the ex-slaves at Fort Monroe in Virginia. The original sheet music, available at the Library of Congress website, has the year 1861 handwritten on the front, and on the fifth page informs that "This Song has been sung for about nine years by the Slaves of Virginia." Tell old Pharoah, to let my people go. Cite This document | Unknown, “"Go Down, Moses",” HERB: Resources for Teachers, accessed April 23, 2019, https://herb.ashp.cuny.edu/items/show/852.